A ceremonial Border Personal Meeting (BPM) to commemorate joint celebrations of the Indian festival of ‘Diwali’ was organized by Indian Army at Bum La on Wednesday. 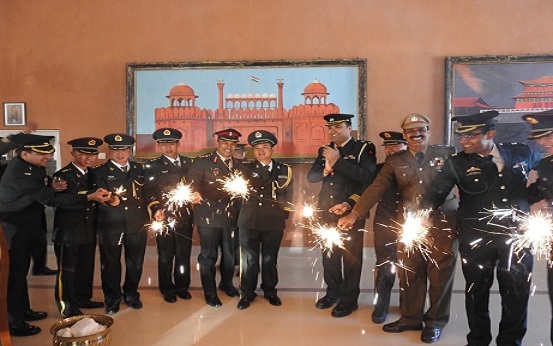 A ceremonial Border Personal Meeting (BPM) to commemorate joint celebrations of the Indian festival of Diwali was organized by Indian Army at Bum La on Wednesday. The delegations led by Colonel Prasenjit Kar from Indian side & Colonel Yang Zi Ming from Chinese side interacted and exchanged greetings in a cordial atmosphere, a signature of improving military to military ties at ground level. The meeting began with hoisting of National flags and included lighting of traditional Diwali Diyas and the ceremonial address. Both sides highlighted the importance of maintaining peace and tranquility along border areas besides ensuring sanctity of LAC. The delegation leaders emphasized the need to maintain and continuously improve relations at ground level which ultimately act as a ‘catalyst’ at strategic and diplomatic levels to foster cordial ties between the two great nations of the region. Highlights of the BPM were the colorful and impressive performances by cultural troupes, showcasing ‘Real India’ to the friendly neighbours. On the occasion, the delegations interacted freely in a congenial and cordial environment and finally parted carrying feelings of friendship and mutual commitment towards bolstering existing ties.